In class, I'll tell you what you need for our assignments and tests. Sometimes you can get more information here, or on other on-line pages. During the fall term, \americanways.htm had the same vocabulary as \xmu-materials.htm; but the two pages are now different. 1. Why is an implication important to academic writing? A good implication shows how your topic is relevant, so it is a great way to end an academic paragraph or essay. 2. What should a topic sentence do and what shouldn’t it have? Topic: describe something with two similar parts or aspects: e.g., two positive aspects of campus life, two nice features of a city you are familiar with, or two related parts of the Chinese education/law system. You can choose just about any topic, as long as the two parts are similar/related. You will do this assignment with your new partner; two people, one paper. 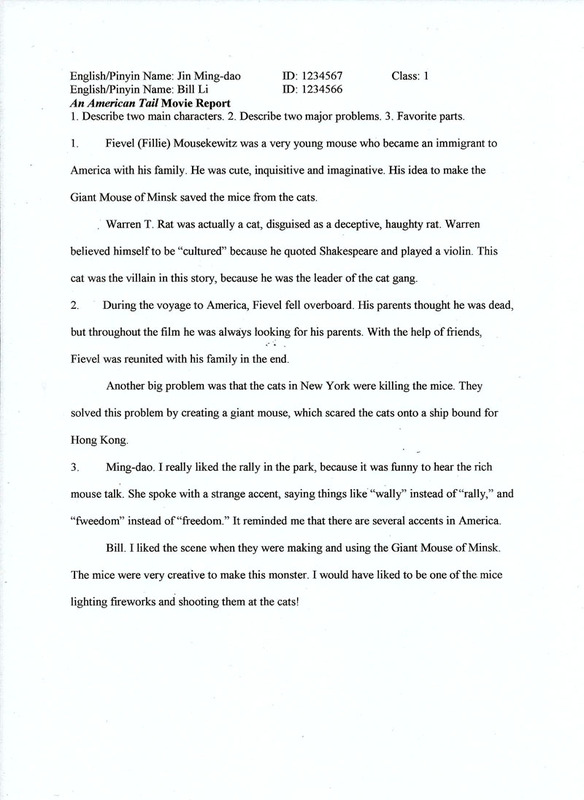 Assignment A is a typed outline for a 4-paragraph essay. For the “Introduction”, give me a grammatically complete “Thesis Statement” (which will be the first paragraph’s last sentence); but also give me some idea of what will lead to it. “Some idea” does NOT mean complete sentences. This is supposed to be an outline. “Notes” would be something like this: advanced technology and machines (generally no more than 5-7 words). Then write out the topic sentence for each of the two support paragraphs, followed by an outline for those paragraphs. DO NOT give me any kind of conclusion. NOTE: If I discover that your essay contains plagiarism, it will get a zero (for both students). You also lose the privilege of "doing it over" or revising it. This will also badly affect other aspects of your semester grade. Therefore, do not plagiarize!! Your paper must be typed and double-spaced. Note: You should be able to put this on ONE page. If you have trouble, don't "double space" the "notes about support" sections. Use your own words, not something from the "movie study guide" or Internet. If I find any part of your work on line (or word-for-word on another student's paper), the whole assignment will get a zero. It must be typed and double-spaced, using a 12-point Arial or Times New Roman font. Keep your answers simple; each item needs only about three sentences (see the sample). FILL your page, but do NOT use more than one page--if the work goes on to a second page, EDIT your work better. Put your names and other information at the top, EXACTLY like you see it at the top of the example. If you do not follow these directions, I may ask you to fix it before giving it to me, which means it will be penalized for being late. (1a) a simple description [NAME was a young man (old woman, etc.) who...--then use an interesting verb like wants/needs/hates/dreams...); (1b) tell me about his/her character or personality; (1c) why is he/she important to the story? 2. Describe (very simply) two major problems or issues, and tell how the problem/issue was resolved. Unlike the sample below, I expect students to fill one page while doing this report. The teacher will tell you the DUE date. Remember that "late" work gets a BIG penalty (see the "Welcome" sheet). "Main characters" are listed on the "movie study guide". © 2014 Michael Krigline, all rights reserved. As far as I am concerned, people are allowed to print/copy it for personal or classroom use.